The True Lover’s Knot is a decorative knot that symbolizes, as the names suggests, true love. 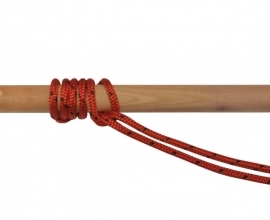 It is made out of two intertwined Overhand Knots. 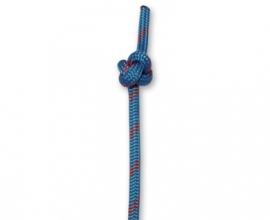 Although it has the characteristics of a bend, this knot should only be used as a decorative knot, because of it’s high chance of jamming when under pressure and becoming undone when left slack. 1. 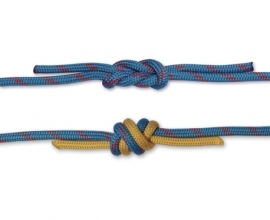 Create an Overhand Knot in line A. Tuck the working end of line B through the center of line A’s knot. Create a crossing turn in line B by placing it’s working end over it’s standing end. 2. Tuck line B’s working end though it’s crossing turn back to front, making a second Overhand Knot. 3. 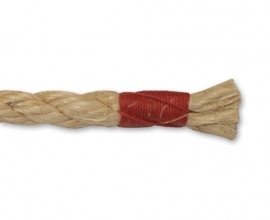 Dress the knot by pulling the ends in opposite directions. You find an story about “the true lovers knot” in the Zuiderzeemuseum at Enkhuizen (Netherlands): when a sailor came home and saw this knot hanging on his door, he was still welcome to come in. However when the strands were hanging apart with the overhand knot, the sailor was not welcome any more and had to look after another place to stay. The same story is told about the fishermans knot at the Bataviawerf at Lelystad (Netherlands) Marriages are closed on board of the VOC-ship Batavia-.The official asks after the official part to close the marriage by pulling at the ends of the fishermans knot by husband and wife so the knots are closing in and fitted together.